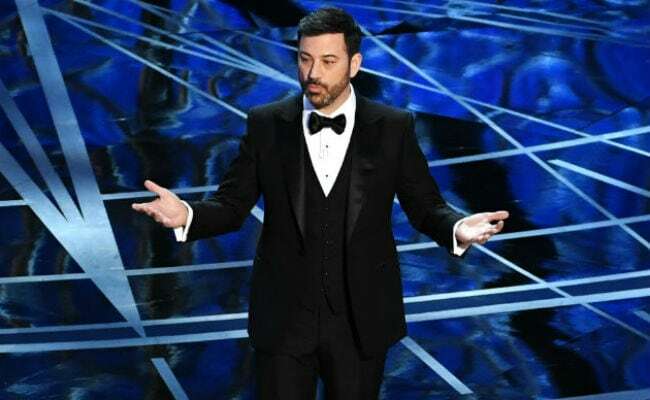 At the start of his late-night show Monday, ABC's Jimmy Kimmel described his completely normal weekend activities: Went to a wedding. Got a flu shot. Wound up in a fight with the president's son on Twitter. "Which is an interesting question, especially because the president tweeted this demand for equal time after watching 'Fox and Friends' breathlessly drool about how great he is for three hours straight," Kimmel said, adding, "He took the time with his little thumbs to put the word 'unfunny' in quotes, which means we have a president who doesn't know how air quotes work. We basically have Joey from 'Friends' running this country." Kimmel noted that after he replied to Trump ("Excellent point Mr. President! You should quit that boring job - I'll let you have my show ALL to yourself #MAGA"), the president's son Donald Trump Jr. shot a tweet back to Kimmel: "Thoughts on Harvey Weinstein?" Kimmel explained the backstory to his audience. "I don't know if you know about this, but there was an exposé in the New York Times about decades of sexual harassment accusations made against the movie producer Harvey Weinstein, who is not the president and isn't particularly well known outside of L.A. or New York," he said. "But the insinuation was that we, as part of the biased, left-wing media propaganda machine, wouldn't say anything about him because he's a Democrat - never mind the thousands of jokes about Bill Cosby and Bill Clinton." "Great I look forward to your monologues next week. You're probably due for a change if only for a moment or two." - Donald Trump Jr.
"I posted a video of Daddy on the 'Access Hollywood' bus," Kimmel explained. "It just so happened to be the one-year anniversary of that tape being released, so I thought we should celebrate." Kimmel continued: "So people are pointing to the fact that Harvey Weinstein was a Clinton supporter, and listen, it's true. I'm not defending Hillary Clinton. The fact is, her campaign did take money from what turned out to be a high-profile man who's been accused of sexual harassment multiple times. And not just one of them, by the way. She took money from two of them: Harvey Weinstein and Donald Trump, who donated to Hillary's campaign in 2008." A photo flashed on screen of Clinton with Weinstein - and another picture of her with Trump from years ago. "So anyway, note to DJTJ," Kimmel concluded. "Next time you're defending your father and you think it's a good idea to draw a parallel between him and a freshly accused sexual predator? Don't. It doesn't help. It really doesn't." And, because Kimmel said he would, he told a Weinstein joke: "What's the difference between Harvey Weinstein and the Pillsbury Doughboy? When the Pillsbury Doughboy offers you a roll, he doesn't ask you to watch him take a shower for it."